When this beautiful little girl was born, doctors told her parents that she had a rare congenital disorder known as Arthrogryposis Multiplex Congenita. The condition meant that Emma did not have – and would never develop – the strength to lift her own arms. But thanks to some amazing doctors and a healthy dose of science and technology, Emma now has “magic arms” that allow her to play, draw, and even hug her mom. The touching story told in the video above would never have been possible without 3D printing, a high-tech way to immediately manufacture 100% custom parts. 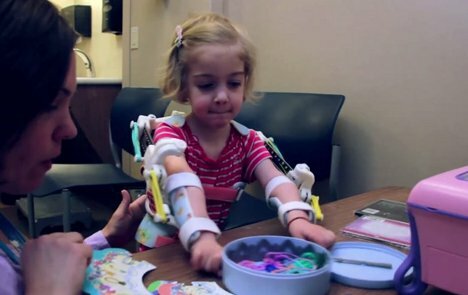 Whenever a piece of Emma’s “magic arms” breaks or wears out, her mom can call the researchers who designed the device and have a new part printed instantly. With no wait time for a new part, Emma suffers far less down time without her incredible assistive device. We dare you to watch the video and not get at least a little misty-eyed. See more in Cybernetics or under Technology. August, 2012.